Following their victory over Childebert at Bayeux, the Breton army returned to Armorica where they remained for the rest of this period. More families migrated to the Saxon and Frisian settlements giving both Childebert and Chlothar pause to negotiate treaties with their respective intruders. Content that the migration issue would remain quiet, both Childebert and Chlothar make plans to retake the lands of Aquitaine lost to the Visigoths in recent campaigns. Later that year, heading the appeals from the Thuringian nobles Theudebert leads an army to confront the Bavarian invasion. Encountering an Ostrogothic revival in Italy, the Byzantines request the support of their ‘allies’, the Franks to deal with them. 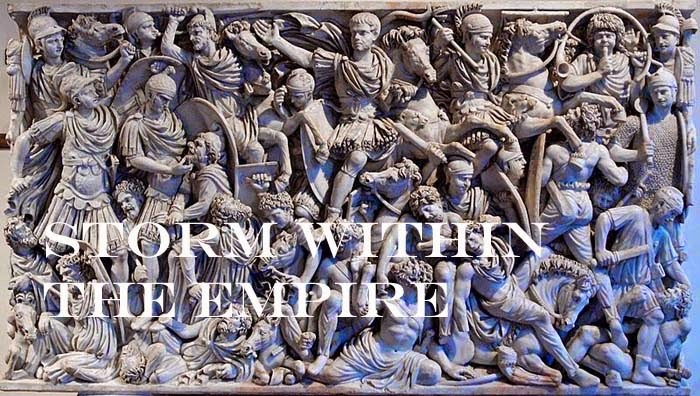 In reply, Theudebert would send troops as quickly as the current internal and external conflicts could be resolved and so Belisarius made plans to campaign in the following year. During the summer, the combined forces of Childebert and Chlothar meet the Visigoths south of Orleans. Fought near the Loire River, the Neustrian army is defeated by the Visigoths forcing both Frankish kings to retreat to their respective domains. Across the Rhine, Theudebert with Thuringian allies engage the Bavarians near Giessen and soundly defeat them killing their king. The realm of Thuringia now becomes part of the kingdom of Austrasia which should deter any further threats by the Bavarians. The defeat in Aquitaine coupled with the Breton, Saxon and Frisian incursions has spurred a wave of discontent among the nobles of Neustria tantamount to open rebellion. Not only has the commercial trade been disrupted by piracy but the rising cost to support the ineffectual wars is proving a tipping point for the disaffected nobles; the situation is quite similar in the fiefdom of Chlothar. The situation leads both sides to raise armies and these met to do battle a day’s march from Paris. The defeat of the royal army sent Childebert to seek the safety behind the walls of Paris with the rebels in pursuit. Heartened by the news of Childebert’s defeat, the nobles of Reims rise in revolt against Chlothar. Those armies met in August and rebel forces defeated Chlothar near the River Aisne. Leaving his troops to their fate, Chlothar fled to his capital at Reims and sent messengers to his nephew, Theudebert, for help. Rebel forces besieging both Paris and Reims disperse before the winter snows and vow to return next spring to resume their fight. Theudebert used the winter period as to how best to aide his treacherous uncles news arrived of Childebert’s death (assassination?). Aware that Childebert had no heir to succeed him, Theudebert moved quickly to Paris to set himself as regent until the question of a successor could be resolved. Chlothar was in no position to contest this decision as he would not stir far from Reims with hostile nobles moving about the land. Three summers have passed and the diplomatic skills of Theudebert have gain fruition arranging the union of his son and heir to Chrodoberge, the eldest daughter of Childebert; a union that would expand the Austrasian realm already increased by the recent acquisition of Thuringian lands. Burgundy was now a staunch ally, however, regaining Aquitaine would require some thought as the Visigoths were led by capable generals and have not been defeated in open battle. As the calendar approaches the next decade (turn 5) good news appeared on the horizon as the majority of Saxon and Frisian activity now moved across the channel finding Britannia a richer prize. Chlodomer dies in 530 leaving no heir to succeed him. Both Childebert and Theuderic seize on the opportunity to enlarge their domains, but first the Visigoths must be forced out of Aquitaine. Recalling the Burgundian debacle, a joint venture by Childebert and Theuderic is out of the question and Childebert solicited help form Chlothar. Their planned expedition was cut short by the unexpected incursions by Saxons and Frisians. Each moved to intercept the invading forces. 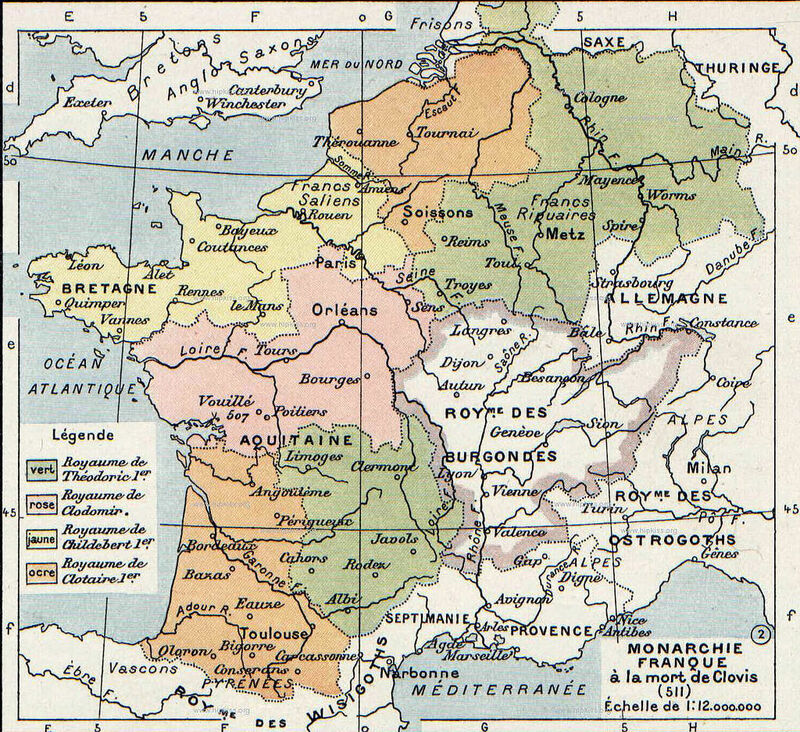 Accused by his brothers for instigating the invasions by Saxons and Frisians, Theuderic successfully seals an alliance with Burgundy; an agreement would ensure the protection of Burgundy against Visigothic aggression and safeguards Theuderic’s lands bordering Aquitaine. A union of the royal houses was planned for the following year. The Bavarians march into Thuringian territory in 533 and defeat their army. The loss of their king in that battle forced the vassal kings of Thuringia to seek help across the Rhine to fight the Bavarians. Battle reports: Childebert confronts the Saxons, Chlodomer the Frisians and the Bavarians clash once again with the Thuringian. During the winter of 534, Childebert and Chlothar meet in Paris and discuss how best to deal with the current situation and postpone the campaign for Aquitaine. The Saxons had spent the winter near Bayeux this would mean more raiders would surely follow in the spring. Chlodomer had some respite as the Frisians favoured their island homeland more, but would certainly return the following year. 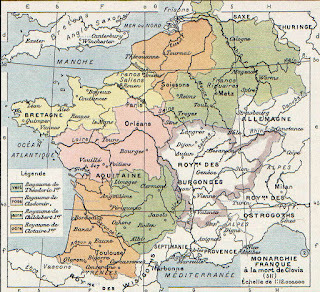 Claiming Armorica as a vassal state, Childebert ordered its troops to meet with his forces near Bayeux to deal with the Saxons in the spring. The Bretons eagerly assembled its troops to meet Childebert, not at Bayeux, but at the frontier with sword and spear in hand to discuss this misconception of ‘vassal state’. Seething with anger, Childebert assembled the army to deal first with the ‘revolt’ before marching on the Saxons. Further to the south, the Visigoths expand their hold in Aquitaine. Theuderic did not live long to enjoy his victory over the Bavarians, but his death in 534 did bring small joy to Childebert and Chlothar as both were recovering from humiliating setbacks by Saxon and Frisian armies. Theuderic was succeeded by his son, Theudebert, an experienced commander having gained a reputation in the wars across the Rhine and a skilled diplomat as he was the principle architect of the treaty between Metz and Burgundy. As the winter of 539 approached, both Childebert and Chlothar rebuild their lost manpower and more importantly the finances needed to sustain it for the planned campaign for Aquitaine. The Visigothic king knew this and was aware the failed Frankish mission to bring the Byzantines into the proposed conflict as the East Romans were too involved in Italy to help. The most important question for the moment was ‘what is Theudebert planning? ‘So many things to consider. Theuderic strikes the Bavarians, Childebert contests a Breton rebellion, Saxons raid deeper into Frankia and the Frisians maul Chlothar. Childebert finds the Saxon warband sacking a Frankish village flanked on two sides by hills. Deploying the militia to their front the tribal Franks take up a position on the left flank with the cavalry extending the line further. The intention was to have the mounted Franks encircle the Frisian horde and assault them from their rear. Disturbed by the appearance of the Franks, the Saxons quickly formed deep columns and marched forward at a brisk pace. A small detachment left behind to defend the village would keep the Frankish cavalry at bay. Childebert’s shield wall collapsed under the Saxon fury leaving his mounted group dangerously exposed. A quick assessment of the mass number of Saxons pouring through the Frankish line, Childebert called for a general retreat handing the Saxons a convincing victory (5 – 0). The Frisians have deployed their battle line not far from their camp. Chlodomer formed his shield wall to face the bulk of the Frisian force and positioned his tribal warriors on the far left. These would attempt to flank the enemy line as the Frisians moved forward. Noticing the hesitancy of the Franks to advance, the Frisians chose to clear the wood before making a general assault and so made the necessary adjustments in their approach. The Franks countered this by advancing their line forward which had the adverse effect, the Frisians changed direction to fall on the Frankish shield wall and breaking it. Within minutes the battle was over as all Chlodomer could view was a oncoming wave of Frisian pagans leaving the corpses of nearly half the army soaking the battlefield (5 – 1). Thuringia and Bavaria continue their feud. The Thuringian and Bavarians (top of the photo) deployed their armies in a narrow clearing between woods and a lake forcing both sides to form deep columns. As their positions were askew of one another, both forces had to wheel their lines as they approached. In that moment, both sides secured the wood on their right flank. The struggle was long and hard but the Bavarians persevered by killing the Thuringian king. Seeing this, the Thuringian warriors lost heart and fled the field (4g – 1). Theuderic confronts the Bavarian threat. Theuderic confronts the Bavarians on a battlefield reminiscent of many previous; plenty of wood, marsh and lakes. The clearing between wood and marsh would allow sufficient deployment for both armies and each side formed their battle lines with reserves positioned as a second or even third line. Theuderic moved his mounted force far to the right allowing room for troops from the third line to extend the main battle line. Theuderic placed greater reliance on the performance of his Riparian troops and these would form his centre and right flank. The Bavarians charged first catching the Franks by surprise; both sides inflicted casualties. The decisive moment of the battle came with the loss of the Bavarian king thereby creating a moment of confusion. Theuderic seized his chance to charge home with his cavalry encouraging the Bavarians to flee the field giving the Franks a clear victory (4g – 1). Childebert viewed the non-compliance by the Breton as a rebellion and the Breton were more than happy to discuss the matter with the sharp edge of sword and spear. Half the Breton force was mounted giving them an advantage with their mobility. Childebert extended his infantry line reinforcing the left flank with extra troops. The Frankish cavalry formed a reserve ready to counter any attack attempted by the Breton cavalry. Seeing no flank attempt on his left, Childebert quickly advanced his line to overwhelm the Breton infantry. Both lines were heavily engaged with the Breton gaining a slight advantage of casualties inflicted. Sensing the moment right for committing the Frankish cavalry, the Breton cavalry suddenly appeared as an apparition. This gave the Breton tribal infantry time needed to crush their militia routing the remaining Frankish infantry to gain a clear victory (4 – 1). Smarting from the defeat dealt by the Breton, Childebert was forced to meet the Saxons near their encampment at Bayeux. With the shoreline protecting his left, Childebert used the marsh to cover his right flank. The Saxons adjusted their battle line as they approached to match that of the Franks; as they were in no hurry to attack. The Saxons destroyed the Frankish shield wall in quick tempo sending a shock wave to the cavalry forming the Frankish reserve. The breakthrough on the left was the last step needed to see the battle could not be turned around. Childebert sounded the general retreat leaving the Saxons the field (4 – 0). Unaware of Childebert’s defeat from the Saxons, Chlothar decides to confront the Frisians on similar ground. The Franks used a novel deployment of a small first line supported by a longer second line not far from their camp. Somewhat surprised by the unusual deployment the Frisians were determined to take the battle to the Franks if need be. As expected, the first line moved to new positions on either flank giving the Frisians no choice but to clear both woods before moving ahead. After clearing both woods, the Frisians engaged the main battle line of the Franks. The gaps created by Frankish casualties were quickly filled by the cavalry reserve. Repelling the cavalry strengthened the Frisian resolve to continue with the slaughter of the Frankish militia and tribal infantry; the loss of the latter tipped the scales for the Frisians giving them a convincing victory, but not without some losses (4 – 2).